As a Howell property owner, you have an obligation to ensure that your property is properly maintained. One of the most difficult tasks to stay on top of is lawn maintenance. At your residence, your lawn is critical to your family’s enjoyment of your outdoor living spaces. At your business, your lawn and landscaping is critical to to professional image that your commercial property projects to potential customers and clients. The best way to ensure that your lawn and landscaping always looks its best is to develop a relationship with a professionally licensed landscaping contractor. In Howell, the most highly skilled and experienced landscaping contractors are at Rainmaker Irrigation. They can help make Howell lawn maintenance easier for you in many ways. 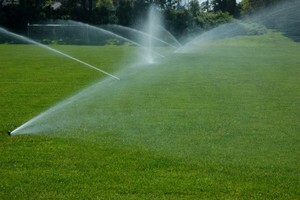 One great service that they provide is sprinkler irrigation system installations. Installing an underground sprinkler system is a great way to limit the amount of time that you must invest in landscaping maintenance. When you hire the professionals at Rainmaker Irrigation, you will receive all of the following benefits. When you install a sprinkler system on your Howell property, you will no longer need to worry about watering your lawn. At Rainmaker Irrigation, their professionals can install as system that turns on and off automatically at the best time of the day. You will no longer need to worry about long periods without rain turning your landscaping into an unsightly brown mess. When you hire a professionally licensed landscaping contractor to install your irrigation system, you can feel confident knowing that all of your needs will be accomplished. At Rainmaker Irrigation, their Howell irrigation experts have the knowledge, skill, and experience necessary to design the best sprinkler system specifically for your home or business. Their team will customize every aspect of your lawn irrigation system to your unique needs. Through their expert design and installation services, you are guaranteed to thoroughly enjoy your new sprinkler system well into the future. At Rainmaker Irrigation, their Howell landscaping contractors focus both on system performance and system efficiency. As their first priority, they will ensure that your new lawn sprinklers provide your landscaping with the optimal amount of water. At the same time however, their irrigation experts will design your system in a fashion to promote water efficiency. They can install moisture and rain-shut off sensors to ensure that your automatic sprinkler system never wastes any water. With their expert help, you will surely have the most convenient and beneficial landscaping irrigation system possible. If you need to hire a professionally licensed landscaping contractor to assist you with a sprinkler system installation project in Howell, call Rainmaker Irrigation, today at 734-564-1373, or fill out our online request form.